GeoPipe Oy's patented GeoDuo M32 collector is designed to be mounted 115 mm boreholes. 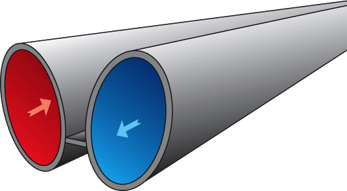 Pipe diameter is 50 mm, but the oval shape makes it possible to fit it into a 115 mm borehole. Between the pipes is a separating wall to ensure that the tubes doesn't touch each other, which would create a thermal short circuit. Thermal conductivity of the rock is usually 3.0-4.0 W / Km, while the thermal conductivity of water is only 0.6 W / Km. Less water between the rock and the pipe gives a better conductivity from the rock to the brine circulating in the pipes. 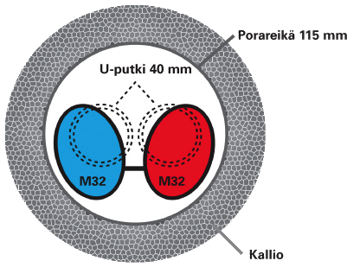 GeoDuo M32 pipe cross-sectional area is 56% greater than 40 mm from the pipe, the pipe is much closer to the rock. In deep boreholes (200 m <) pressure drop of 40 mm pipe is often too large. Ground source heat pumps are designed to work at 3 ° C temperature difference. If the pressure drop is too large, the temperature difference is increased and the heat pump efficiency falls. The pressure drop of the GeoDuo M32 is approx. 60-70% smaller than in 40 mm pipe. In practice, this means reduced consumption of electricity of the brine pump and better efficiency of the geothermal system.